Home \ Blog \ Loans \ What is a Loan Origination Fee? While a loan is a versatile tool that can help you out in many different financial situations, it’s important to know that they aren’t free. In fact, when it comes to most loan types, there will be a number of costs associated with the process which range beyond the loan balance itself. The additional loan costs you end up paying will depend on a number of things. One common fee that many borrowers may not factor into their budget, or may not even be aware of is the loan origination fee. Need a guide to budgeting? Take a look at ours. Why Do Lenders Charge Loan Origination Fees? As we said, when it comes to almost any loan product, whether it’s a relatively inexpensive short-term loan or are a more expensive one, like a mortgage, you’ll generally see a few additional fees listed within your contract. For instance, an interest rate is an extra fee that your lender will charge you for the cost of borrowing. You may also be aware that defaulting on your loan comes with a certain penalty fee when you miss your payment date, whatever the reason may be. However, what you might not know is that there can also be several administrative fees tacked onto your final loan cost, and that’s where the loan origination can come into play. Click here to see how lenders arrive at interest rates. Administrative loan costs are set in place because lenders need to go through a particular process when you apply. Whether the lending company is a small organization with a few employees or a major institution with a sizeable team, one thing is sure, they must task one or more workers with processing your loan application, an operation that can definitely take some time and effort to complete. Want to avoid being rejected for a loan? Read this to know how. Furthermore, different loan amounts come with different levels of risk and reward, leading to even more use of human and financial resources. As such, an “origination fee”, sometimes called a “disbursement” fee, will be applied to many different loan types. Essentially, the more paperwork that needs to be filled out, the more expensive the loan is, and the more risk your lender is taking, the higher your origination fee will be. While not all lenders charge origination fees, particularly when you’re applying for smaller loans, those that supply larger loans often do, simply because they’re taking on added risk by letting you borrow more significant amounts from them. Does financing a loan hurt your credit score? Find out here. Mortgage closing costs are where you will often see a lender or mortgage broker tack on an additional charge for origination. In fact, they are even more commonly seen with mortgage brokers. This is because your broker usually needs to contact several third-party lenders in order to find you the appropriate mortgage, as well as the best interest rates available. When it comes to mortgages, so much time and paperwork go into the process that your lender or broker generally has to charge for origination. Look here if you’re not sure whether to apply with a bank or a broker. A similar effect can be seen when you apply for a traditional installment-based product, such as a personal loan. If you were to apply for a relatively small amount, like a few hundred dollars, your lender may waive the origination fee because the level of risk involved is also small. Then again, if you were to apply for thousands of dollars, they would once again need to put in a lot more effort on the administrative side of things. In the end, if you want a large loan amount, you’ll have to pay up for it. Trying to get the best personal loan for your financial situation? Check this out. How Do I Calculate the Cost of My Origination Fee? Assuming your lender does charge one, a standard origination fee is equal to 0.5 – 8% of your total loan cost. Again, the more money you’re requesting and the more of a risk your lender considers you, the higher the origination fee could end up being. So, let’s say you’re applying for a personal loan of $10,000 and your lender charges a 1% origination fee. You would take your total loan balance and multiply it by the percentage of origination ($10,000 x 0.01% = $100). With certain lenders, the origination fee will be deducted from the total loan amount which, in this case, would leave you with $9,900. However, if you need the full loan amount, lenders may add the fee to the overall cost of your loan, similar to how your interest rate would work. While some lending sources will ask you to pay the fee upfront, others may allow you to pay it off via installments, especially if it pertains to a sizable balance, as you would see with a mortgage. 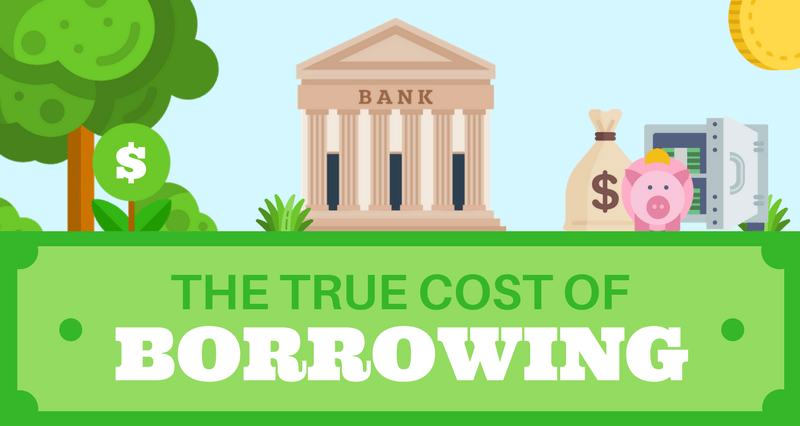 Take a look at this infographic to see the true cost of borrowing in Canada. Is There a Way to Reduce My Origination Fee? The good news is that origination fees can sometimes be lowered when you present yourself as a less risky borrower. Remember, the less time and effort that a lender must spend considering you as a potential borrower, the more reasonable your loan origination fee will be. However, not all lenders will be open to such compromises. If you’re applying for a standard loan, they may charge you a standard fee. Then again, if you bring something to the table when applying for a large loan, the circumstances may change. This is why the lowest mortgage rate might not be what you need. So, before you apply for any loan, be sure to ask your lender what they will charge you for loan origination, as well as closing, and other administrative costs. Once you have a detailed list of all those costs, you can factor them into your budget. Make sure you can comfortably afford all these fees, plus your upcoming loan payments, so that you can avoid any debt issues in the near future.